I have to admit that I am totally and completely in love with CEREAL! Ever since I can remember, I've been a cereal fiend. I'll eat it for breakfast, dinner if I'm not very hungry, a late night snack or even dessert if it's a sugary cereal. The one thing that has always frustrated me though is how quickly cereal turns soggy in milk. Cereal tastes divine while it is still crunchy, but after about 10 bites, it always turns into sog-ville no matter how fast I try and eat it. That's why my curiosity was definitely piqued when I heard of Obol "The Original Crispy Bowl". Obol has a unique design which allows your cereal to stay super crunchy from the first bite to the last. How? Keep reading to find out! I reviewed the Obol in Cream White from Obol LLC, which retails for $19.99. The Obol was created by another serious cereal lover who, when returning to his bowl of cereal after quickly checking his email, discovered a soggy mess. :mad: This led to an AHA! moment where the Obol was born. 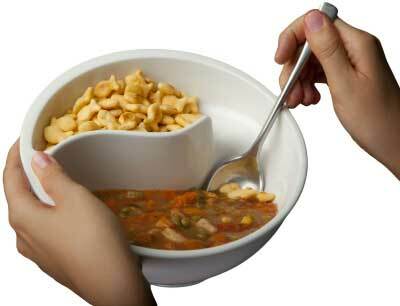 The Obol is unique in that it is meant to be held in your hand, unlike other bowls which are awkward and slippery. The most important feature of the Obol though is the two inner compartments that allow you to separate your cereal from your milk. Now you can easily use your spoon to scoop just a bite or two of cereal in the milk and then eat it before it gets soggy. Need to tend to an urgent matter, such as answering the phone or caring for your child? No worries, for when you return, your cereal will still be dry and crispy until you choose to add it to the milk. The great thing about the Obol is that it can be used for many more purposes than just eating cereal. For instance, you can keep your soup's crackers crispy by adding just a few at a time thanks to the Obol, and cookies and milk work great in the Obol too. I love using the Obol to eat tortilla chips and salsa or guacamole while watching television. I put the salsa or guacamole on the upper tier and use the lower tier to hold my tortilla chips, since the lower tier is larger. Before, eating chips and salsa in front of the television was a major no-no for I always seemed to make a mess, but with the Obol, I haven't spilled a drop and have everything in an easy-to-grip bowl. Cleanup is also a breeze since the Obol is top-rack dishwasher safe! The only drawback that I've found with the Obol thus far is that I can't eat a large quantity of cereal with it. The top tier which typically houses the dry component isn't as large as I'd like it to be and so I have to pour more cereal in it frequently as I eat. I do tend to eat a large amount of cereal at one time though, so this might not be an issue with anyone else. Another feature I love about the Obol is that it is made right here in the United States. :usa: I think it's wonderful when manufacturers go out of their way to open up new employment opportunities for the folks living right here in our own country. If you are sick and tired of eating soggy cereal and wish there were a better way, there is! I highly recommend trying the Obol for yourself and find out how great it is to have crispy cereal from the first bite to the last! Disclosure: I received the Obol in Creamy White from Obol LLC in order to facilitate my review. No other compensation was received. This product review is based on my own personal experiences with this item and is completely honest and objective.